Helle Nebelong is a Danish landscape architect. Since 1994, she has worked for the city of Copenhagen covering project development, policy making and public consultation in relation to roads and parks, urban design and planning. Since 1990, she has run a private practice that specializes in the design of green spaces for young disabled people. When we renovate public playgrounds and ask the local residents what they want for their play area the answer today is equipment from nature. I think this is a reaction to decades of use of standardized and unimaginative playground equipment. When using materials from nature, themes are introduced, but it is the children, with their own imagination, who give colour to their play and bring things to life. It is not just a trend. Studies show us again and again, what we have thought for a long time, that children are healthier when they go outside and play in natural surroundings. It sharpens their concentration, it is a necessary development in the maturing process in preparation for school, where they must be able to sit still and listen and learn. Their muscular development is strengthened and the children are ill less often and more socially developed. I am convinced that standardized playgrounds are dangerous, just in another way: When the distance between all the rungs in a climbing net or a ladder is exactly the same, the child has no need to concentrate on where he puts his feet. Standardization is dangerous because play becomes simplified and the child does not have to worry about his movements. This lesson cannot be carried over to all the knobby and asymmetrical forms, with which one is confronted throughout life. The ability to concentrate on f. ex. estimating distance, height and risk, requires a lot of practice and is necessary for a person to be able to cope successfully with life. The focus on safety is essential but must not lead one to forget to care about design and atmosphere and make one buy the boring play equipment because it is easy and secure. When designing play spaces for children there are one thing apart from economics, which is essential and that is genius loci, the spirit of the place, in other words the qualities and the atmosphere already present. This can be a part of a building, a tree with character, something that happened at the place, an old sculpture or something else. Genius loci are an important starting point and can be the approach to decide the design of a new space. The first play area I want to tell about is Murergaarden - an integrated institution in Norrebro. The institution has 64 children aged 0-6 and one hundred children aged 7-14. The play area is only 1.050 m2. It was split up earlier into two separate playgrounds. As you can see at the picture there was a fence between them and a difference in the levels of at least 2 m. In some way this difference in level was part of the genius loci. The old playground from the 70's was completely run down. 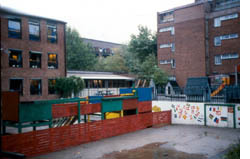 The local authorities decided in 1996 to hold a theme day on playgrounds for the leaders of institutions for children in Copenhagen. The employees of the institutions were briefed to put forward their ideas for the "perfect" playground. It was stressed right from the start, that there would not be the usual economic speculations - it should be imagination alone, supported by pedagogical arguments, which would decide the final suggestion for a playground. Although the developing process was purely made by the adults the ideas for the perfect playground came from listening to the children's preferences and wishes for the play area. It was my job to collate the many suggestions and, on the basis of these, design a new playground for Murergaarden. The result was a little organically shaped oasis, which complemented the massive surfaces of the surrounding buildings. The largest area of the playground is for the use of all the children, but it is possible to close off a little area for the nursery kids. They did not want traditional play equipment, but they got a slide anyway! 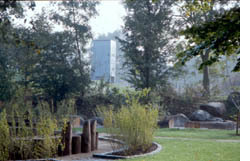 The higher and lower levels have been connected by a terraced slope, which has become a central feature in the playground. 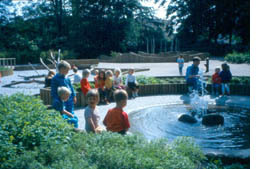 The little paddling pool is tarmaced and is connected to a channel and spring on the upper part of the playground. In the summer a fire-hose is used to fill the steps with water, which falls down to the paddling pool. It takes a couple of hours to fill it. The water is then turned off and allowed to stay in the pool until it is emptied in the evening. The pool is encircled by a willow copse, and Butterfly bushes have been planted and perennial flowers, which attract butterflies and other insects. There are many details: it is the little wonders that counts! At the beginning there were many reservations about the new playground. Parents said that it was dangerous with all the big stones. The employees of the institution said the space was just too boring. But the children love the space. The playground has now been in existence for more than 4 years. Not one child has been hurt seriously. The parents now say, that the children are happier when they come home. The leader of the institution says that there are fewer conflicts in the playground. They are really happy with the playground, especially with the water. A constructive debate has arisen between parents and employees in the institution about how far one can protect a child and try to prevent him from coming to harm. 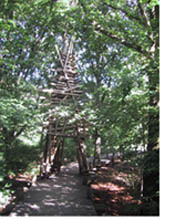 The second play space is the Nature playground in Valbyparken. Valbyparken is the biggest park in Copenhagen. During the past 8 years it has been totally renovated. 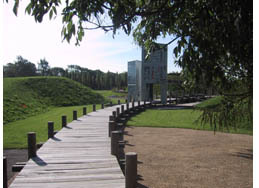 Areas have been laid out with water holes, meadows of wild flowers and hills and in 1996, when Copenhagen was the European Culture City, 17 circular theme gardens were constructed. One of which became the Millennium Garden, which I will tell you about later on. During the past 4 years a 20.000 m2 playground has been under construction using people from the unemployed project. As Valbyparken is an old rubbish dumping area, the environmental authorities demanded that ½ meter of earth must be removed from the whole area and replaced by new, clean earth. The rubbish dump earth must not be removed from Valbyparken and it has therefore been built into a row of hills, which separate the playground from the rest of the park. 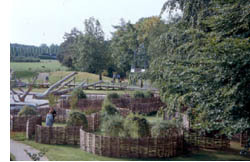 The original woodland, the new hills and the wide stretch of meadow outside the playground. The plan is made up of organically formed elements: A large area with sand and gravel, small green islands, winding paths, a village of woven willow huts and plaited fences, an area with wild flowers and a very big snail-shaped mound with a path spiralling up it to a look-out point. The whole playground is pulled together by a circular 210 m wooden bridge. The planks in the bridge are from the many elm trees, felled in Copenhagen due to Dutch elm disease. For this playground I worked really well together with four incredibly enthusiastic students from Denmark's Design School. They designed six towers which are placed as precise points at the large circular bridge, which pull together the whole organically shaped space. Each tower has its own theme: The Water's Tower, The Light's Tower, The Wind's Tower, The Green tower, The Birds Tower and The Tower of Change. It is often the quite simple things, which awaken a child's curiosity. If everything is not the same and predictable, a child's fantasy is sharpened and if the challenges are there, he will practise climbing up into complicated, twisted trees, throwing small stones at targets and jumping from one big stone to another; children experience and are in a small way getting a little better at everything all the time. This naturally gives self-confidence and courage. One grows and dares to meet new challenges. It is important that children be allowed to find out the nature of things by themselves. Everything should not be explained, demystified, beforehand. There must be time for the child to linger mentally over things and to develop at his own speed. The child's being must be stimulated qualitatively by good materials and a superior, cohesive structure. One special part of the planning of outdoor areas for children concerns the use or non-use of colours in a playground. In my opinion, colour should be used carefully and in small splashes. I think it is an adult idea, created by misunderstanding, that everything to do with children must be openly amusing and painted in bright colours. A child's day is already full to bursting with colours and moving images from the colourful interior of the day care centre, from hours in front of the television and computer screen at home and when out shopping in the supermarket. Children need to be able to relax their eyes and their minds when they come outside. Nature's own colours are perfect for the playground, maybe spiced up here and there with a few artistic colour splashes. The Tower of Light is a good example. From outside it doesn't look colourful but if you step inside the tower you get astonished to see all the light and colours. It has been my ambition to design a playground that would become a good alternative to the many commercial amusement parks, which are appearing everywhere. The playground is also a favorite place for all nursery kindergartens, schools and after school clubs, who visit it on day trips. 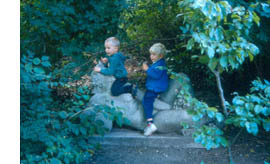 The third play area I want to tell about is the Garden of Senses in Faelledparken. It is an example of an accessible space for children with disabilities. Previously it was an old, run down playground or you could say a big asphalt dessert which needed total renovation. I designed a garden, which should be like a maze with winding paths, leading the visitor past many different experiences. 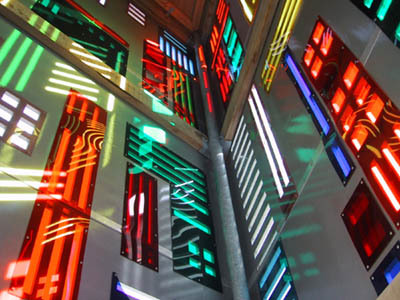 There are several Wonder Spaces with Tangible Sculptures - one sculpture to each of our senses. There are Crossings, a Riverside Scenery with rocks and a Lake Scenery without water, a Lavender Island, a Maze of stakes. A Bamboo shrub, a small Garden of Fragrance with a fountain, prickly evergreens, shrubbery with old, crumbling sculptures, a Pavilion Garden, a grove of Chinese temple trees, a Butterfly Garden and a lot of other elements to discover. I went round Copenhagen's material yards and found a lot of usably leftover materials, which each contained a part of history: Old paving tiles from the Town Hall Square, granite blocks from an old bridge, sculptures from The Norrebro Park - all of them just right for a garden of senses! The sketches became working drawings and the construction work got under way. 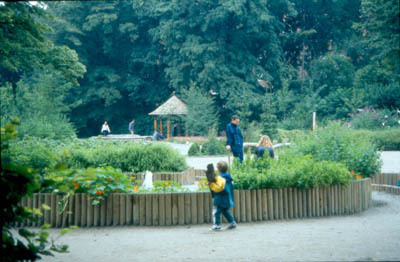 The Garden of Senses was opened in 1996. The six sculptures of the senses were wrapped up in colourful fabric and the children helped the park manager to unwrap them: The Sense of Touch, The Sense of Fragrance, The Sense of Taste, The Sense of Vision and The Sense of Hearing. The sculptures were made by a group of young artists and they decided themselves to create a sixth sculpture, The 6th Sense Gateway. Seen from outside, it is all quite anonymous, but if you go through the gate and turn around, you will see all the religious symbols of the world. The idea behind the Garden of Senses is to give children a glimpse of the richness of nature, in order to awaken their interest, help them to learn about nature and to respect it. 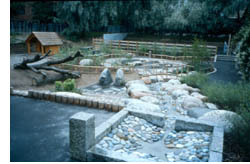 The first Gardens of Senses were created in connection with homes for children and young people with multiple disabilities, who were unable to go out and experience "real" nature. These gardens are usually small plots just outside the doors of their homes. 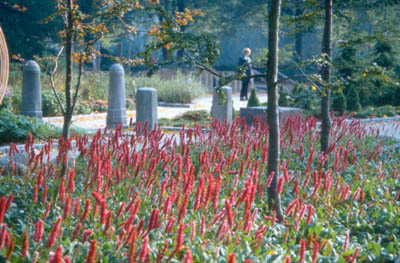 The Garden of Senses in Faelledparken is the largest in Denmark and was the first to be open to the general public. It has been designed to be explored and enjoyed by adults and children of all ages. If you open your eyes, prick up your ears, widen your nostrils and give full rein to your curiosity, you will experience a garden full of surprises, where you can make use of all your senses. The Garden of Senses has become popular and has many visitors. 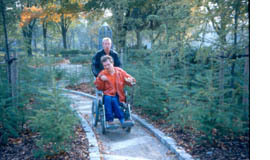 Many blind and handicapped people also visit and use the garden. Children of all ages come and train - although they do not realize it - their mobility and concentration. A bronze alphabet has been attached in the maze, so that one can spell from the first to the last. The garden is full of contrasts. The stones are also varied: rough and smooth; round and angular; big rocks for climbing, small stones that rattle in your hand; There are lots of surprises. An experience in itself is the sight of Hercules and the goddesses surrounded by all the greenery. This old sculpture group used to stand in the Norrebro Park in Copenhagen, but it was vandalized so it was taken down and declared unsuitable to be reinstated. In the Garden of Senses it doesn't matter if the sculpture is missing a nose-tip and half an arm, so now the sculpture group has been reinstated to be honored and valued. Decay is suddenly beautiful and mystical in this green setting.